The city of Olympia is notoriously liberal and free-spirited by nature. There is no shortage of second hand stores, parades, concerts, flea markets, demonstrations, or festivities. And, the closer you get to downtown, the harder it is to turn a street corner without spotting some type of artwork or creative piece. Today, we know Olympia as a community where people hold artistic freedom and expression to the utmost importance, but it wasn’t always this way. It seems hard to believe that the city we know today didn’t always foster the sort of “coffee house vibe” it has going on now, where people can come in to a shop, have a seat, enjoy some local music, and talk politics and philosophy over an espresso. 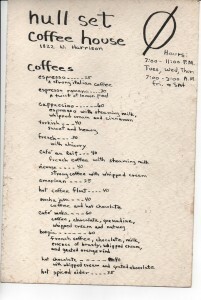 The original menu of the Null Set coffee house sold an espresso for 25 cents. But, it’s not so difficult for Olympia resident Patricia Holm to envision Olympia without its contemporary charms. In fact, she witnessed it this way. I had the pleasure of chatting with Patricia about what it was like to live through such a time. 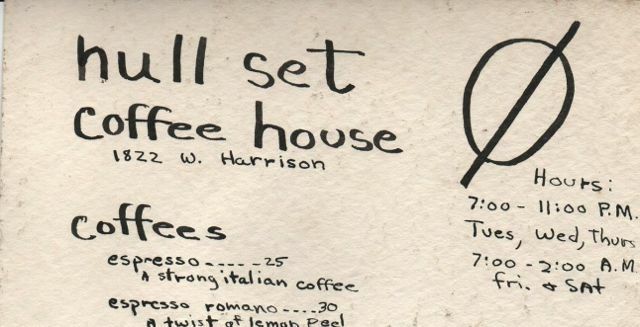 It was 1964 when Patricia, her then-husband Pete Holm, and their friends Bob and Bonnie Gillis came together to bring Olympia its very first coffee house. 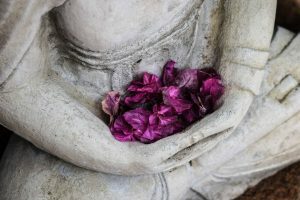 It was called the Null Set, named after the mathematical term meaning “the set that does not contain anything.” It was meant to stand for unrealized potential and new possibilities. The Null Set was a buzzing little hub where quality folk music was accompanied by tasteful specialty coffees and old-fashioned sodas. It was only open in the evenings with slightly later hours on the weekend. It became a central location for the community to gather in a casual, spontaneous setting. Upon moving to Olympia, Patricia thought the city seemed “really backward.” She was eager to bring more life to the area, and she thought a coffee house would do just the trick. But, the Thurston County community didn’t immediately take to the Null Set. Many people who were adventurous enough to stop in said they weren’t quite sure how to react to such a place. 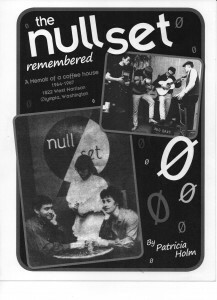 Patricia Holm wrote a book about her experiences operating the Null Set coffee shop. It can be checked out at the Olympia Timberland Library. And, other coffee houses at the time did not invite nearly as many local artists to perform in front of customers. Between the groups and individuals asked to attend, there were 22 main acts during the first year. 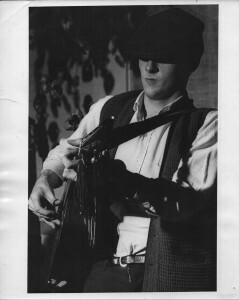 Among them was musician Burt Meyer, who played as part of a folk group called The Blazer Trio. He spoke fondly of the coffee house. Burt credited the Null Set for putting him on a path to making music a vital aspect of life. “At the Null Set, I was exposed to music that was not on the ‘Top Whatever’ list. I first heard bluegrass there from a band called the Turkey Pluckers, and formed a life-long love of the genre, as well as a friendship with Phil and Vivian Williams, the band’s leaders,” Burt commented. The Null Set hosted many benefit concerts during their operating years in Olympia. 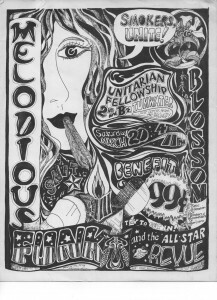 This is an example of a hand-drawn flyer for an event. From then on, Burt tried to include music into everything he did. Burt and his wife, Di, started the Tumwater Bluegrass Festival and helped to found the Olympia Folklore Society with the purpose of creating something like the Null Set after the coffee house went out of business. And, Burt is not the only one to claim that the Null Set made a great impact on his future. Guitarist Dan McKinstry, Olympia’s “Mudcat,” said, “More than anything else, I was impressed by the music. Even if you weren’t talented enough to learn how to play guitar the way these guys could, they would show you that it could be done.” Dan made an appearance at the coffee house at least a couple times each month and was inspired to start building guitars from his experience there. Young Charlie Saibel was just a budding musician when the Null Set made its debut. Charlie fell in love with the coffee house, and hanging around such talented artists strengthened his passion for the piano. He also mentioned that the Null Set was incredibly unique for its time. “Coffee houses were not around [Olympia] then. The special thing about the Null Set is it was a totally unstructured place to get together. There was an intellectual aspect to it. I was sad to hear it was closed later when I moved back to town,” Charlie recalled. Musician Davey Coffin will be attending the Null Set Remembered Again concert on August 9 and joining up with his old band the P.H. Phactor. Unfortunately, the Null Set was forced to close its doors in 1967 when the gang could no longer afford to maintain the business. However, you can experience some of the coffee house’s original musicians on August 9 at the Olympia Farmers Market. Groups such as Burt Meyer’s The Blazer Trio, and the Pacific Northwest’s P.H. Phactor Jug Band will be performing from 11:00 a.m. to 2:00 p.m. on the main stage. Reminisce with the skilled, refined performers during Null Set Remembered Again. Patricia, Burt, Dan, and Charlie were all quick to say just how proficient and adept the musicians were. “The concert’s just going to roll on by all by itself. I do expect to hear some really great music and to rub elbows with the best jug band in the northwest. These guys are for real,” Dan exclaimed. For more information on the line up or to sneak a peak at some groovy photographs from the 1960s, visit the Null Set Remembered Again’s Facebook page here.